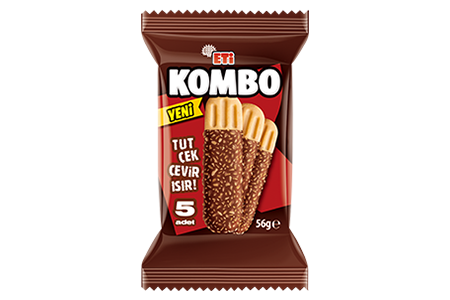 A brand new product from ETİ for the biscuit world; ETİ Kombo. "Kombo Shape" with its upside-down position inside the package, ease of holding and different shape; "Kombo Taste" with scattered crispy taste, real chocolate coating and delicious biscuit. ETİ Kombo will be the favourite product of the ones who want to have filling feature of biscuit and satisfaction of chocolate together.